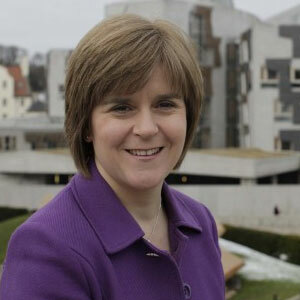 The Scottish National Party will support the creation of an LGBT rights envoy. The party’s leader, MSP Nicola Sturgeon, made the announcement ahead of a speech to the party’s LGBT group at the Out for Indy Conference. Ed Miliband previously announced that the Labour party would introduce an LGBT rights envoy in September – with Lord Michael Cashman set to take up the role if the party is elected. Ms Sturgeon exclusively told PinkNews: “I am absolutely delighted to address the largest LGBTI conference ever hosted by any political party in the UK – the only major, public event held by any political party to mark LGBT history month which I am proud to support. “Making Scotland a fairer, more equal place for all our citizens is at the heart of the SNP’s vision for our country – and it is absolutely right that LGBTI issues are put front and centre ahead of the General Election in May. She will say in her speech: “We can and must do more in all places, and in all walks of life. “Too many LGBTI people in too many countries still face the most extreme forms of prejudice and hate – our voice must be one of those arguing and advocating for equality, tolerance and love. “That is why a team of SNP MPs elected in May will support the establishment of a special envoy, a diplomatic post within the Foreign Office, to promote the rights of LGBTI people throughout the word, as an integral part of UK foreign policy. “I know that other parties, including Labour, advocate this move – just as there is action within the United States to create a similar post there – and I have no hesitation in working across party boundaries to bring it into being. She added: “The stain of intolerance will not be removed entirely from our country or culture overnight – but by the laws and values we promote we can and will move ever closer towards the good society where everyone feels safe and valued and above all equal – regardless of sexuality or gender, race or religion, ability or disability. It was confirmed yesterday that Barack Obama is to create a similar role within the US State Department, to promote LGBT rights around the world. The Labour party held a reception for LGBT History Month earlier this week.